Where do I use my Goldsmiths voucher code? Search for a deal of your choice at NetVoucherCodes. Click through to the Goldsmiths website and start browsing for designer jewellery goods. Fill up your shopping cart with stunning pieces of jewellery for men and women and head over to the checkout. Insert your code into the box provided and select ‘Apply’. Click ‘Checkout’ to complete your order. Gold makes the perfect gift for special occasions. Like memories, its value grows over time. Goldsmiths has been a trusted provider of quality gold jewellery since 1778. With their expertise and refinement, expect that they will provide product with great craftsmanship and amazing designs that truly suits the person you are giving the gift to. Goldsmiths Jewellers are a famous British jewellery retailer who can trace their tradition of excellence back over more than 130 years. Goldsmiths isn’t just any high street jeweller - their international reputation is such that they were the UK’s first appointed stockist of world-famous Rolex watches, and their consummate craftsmanship can be seen in the Rugby League Trophy. Through their online store, you’ll find superbly sparkling diamonds in rings, earrings, necklaces and bracelets, as well as the inimitable Canadian Ice collection and numerous pearl pieces. Amongst their countless pieces of fine jewellery, you’ll see gold, silver and more exotic metals wrought into peerless designs with the greatest skill, with special Bridal Jewellery, Wedding Collections, Men’s Jewellery and a wide array of gifts, including beautifully adorned photo frames, jewelled cufflinks, pens, pendants and more. Goldsmiths have an extensive range of watches available for both Men and Women from top brands like TAG Heuer, Baby G, Hugo Boss, Tommy Hilfiger, and of course Rolex. Whether you are looking for an everyday watch, a sports watch or an occasion watch then you will be sure to find the perfect timepiece at Goldsmiths. Their range includes watches to suit every budget and styles to suit all tastes. They are the UK’s largest authorised retailer of Luxury Watches with high-end brands available at competitive prices and they also offer their customers 0% interest-free credit on selected items. There are big savings to be found in the sale watches section, where you could save up to 50% off the original selling price and no one would ever guess you didn’t pay full price. So if you are upgrading your own watch or looking for a gift, make sure you take a look at the huge choice of Goldsmiths Watches first. If you are planning on popping the question any time soon then you can find the perfect ring with the huge range of Goldsmiths Engagement Rings on offer. Choosing the perfect engagement ring is a very important task and should not be taken lightly, Goldsmiths are experts when it comes to engagement rings, so whether the recipient would prefer a simple diamond solitaire or their full ring encrusted with diamonds, you will be spoilt for choice. They offer 0% interest-free credit on selected rings and also have rings to suit all budgets. Pick a diamond engagement ring, a vintage style engagement ring or a gemstone engagement ring from the extensive range and let Goldsmiths help your path to wedded bliss get off to the best start. Get more delivery details on the Delivery Information page. If you have an item you would like to return, you can request to return it within 14 days of the date it was despatched and 30 days if your request to exchange it. Goldsmith cannot accept earrings or cleaning products if the item if the tamper proof packaging has been tampered with. They can also not accept products which have been personalised, engraved or altered. For more information on Returns & Refunds, click here. Find the opening and closing times of a store near your using the Goldsmiths Store Locator tool. 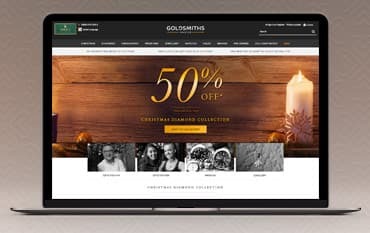 Goldsmiths is a leading Jewellery and Watch retailer selling both online and on the high street. They stock a beautiful range of Jewellery including Engagement Rings, Wedding Rings, Diamond Jewellery, Bracelets, Earrings, Gifts, Eternity Rings, Necklaces and Watches. From Gold, Silver, Gemstone and Canadian Diamond Jewellery to Cufflinks, Jewellery Boxes and Wedding Gifts - there is a massive choice at Goldsmiths including the option to build your own Wedding Ring! Benefit from free delivery, interest free credit and they also offer servicing and repairs. Use a Goldsmith's voucher code on top Brands such as Canadian Ice, Emporio Armani, Hugo Boss, Cross, Montblanc, TAG Heuer, Vera Wang Love and many more, the perfect Jewellery piece, Watch or Gift can be found for less at Goldsmiths. We are constantly on the hunt for first order Promotion Codes for Goldsmiths to help you with your money saving. Our experts check dozens of sites for secret codes including NHS discounts, student sites & social media channels saving you time & money!